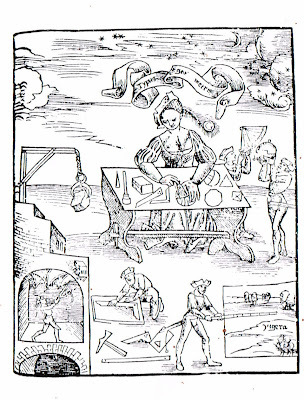 Here are carpenter squares in use in the early 16th century in Germany. "Geometry as a contemplative practice is personified by an elegant and refined woman, for geometry functions as an intuitive, synthesizing, creative yet exact activity of mind associated with the feminine principle. But when these geometric laws come to be applied in the technology of daily life they are represented by the rational masculine principle: contemplative geometry is transformed into practical geometry." I add this to the posts on carpenter squares, geometry, and regulating lines to follow up on some ideas I'm thinking about. a) Carpenter squares were in regular use centuries before Silas Hawes of Shaftsbury, Vermont, made his first steel square in 1815, beginning what became The Eagle Square Co. Local lore wants Hawes to be the inventor of the carpenter square, but it isn't so. b)The practice of geometry has since its beginning been an intellectual, philosophical process - 'contemplative' in the words of Lawlor - as well as a practical skill called Practical Geometry. c) The intertwining of design - contemplative and theoretical - and practice in construction unraveled during the Industrial Revolution. As the master-carpenter and master-mason evolved into the separate professions of architect, engineer, and builder each lost parts of the knowledge and skills, as well as the understanding and appreciation of what the others was doing. 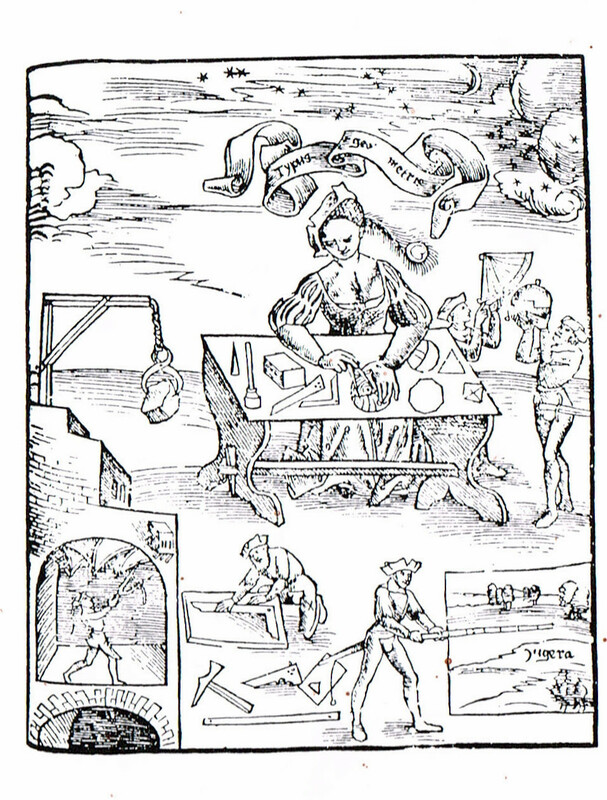 The woodcut is a wonderful window into geometry, crafts, tools, even education in late Middle Ages. The woman is using a compass, a tool that historians often overlook. The famous Geometers (Google it!) were men - some of our best thinkers: Plato, Archimedes, Pythagoras, etc., not 'contemplative' nor 'feminine' as Robert Lawlor writes. I would describe them excellent, theoretical, logical, careful thinkers who also understood how to use Geometry for Practical purposes.. The word 'feminine' has little relevance in a discussion about Theoretical and Practical Geometry. What's fun about these drawings are the platonic solids on the table in the drawing. John Brown, 1661, also had the platonic solids in his portrait/drawing with his carpenter's rule/square. The note on the carpenter's rule is especially fascinating because similar scales are on the rules made by Silas Hawes that are in The Bennington Museum. Thanks for the link. The platonic solids you built are beautiful - and for me easier to read with the open sides than solids would be. I also looked for a link to John Brown, 1661, with no success. Are you aware of the use of the Golden Section and its permutations by master masons in the medieval guilds and in the construction of the cathedrals (and also the English tithe barns)? The use of geometry in construction in Europe long before the Renaissance is documented. I’m not sure if you read what I have written on Will Truax’s blog, but I will pick some of it up here. Standardized dimensions grew out of governmental and cultural normative developments, and that is a separate issue from layout modalities. That is the easiest answer I can give you in a short form, other than to add that the Chinese and Japanese had standard building practices, (zoning if you will,) long before Europe or America. The Japanese foot, (shaku 尺) is almost identical (98.7%) to the Empirical foot, except they chose to segment it into 10th instead of 12th, and this was part of the “zoning,” there governments, (and guilds,) mandated. Now some of your other observation about “framing squares,” I find very interesting, as well. I’m please to see someone else asking these questions, and presenting ideas about the topic. I have a unique perspective on this as a timber wright, traditionally trained and also well traveled. I see things from a not typical American, (European,) viewpoint. Take for example the concept that the framing square was invented by Silas Hawes, innocent view in and by it’s self, but combine that with how often history is bent by these little facts, I become alarmed. So much of history, is “perverted,” in this fashion. Such as the comment I routinely hear, that, “timber framing came from Europe,” or “Square Rule, (also called “edge rule”, and “mill rule,”- which is slightly different,) was invented in America.” I do not try to be polemical on this matter, but many of these comments are clearly false considering the overwhelming evidence to the contrary. However, when I speak of timber framing outside of Europe, I’m told, “that just because a piece of architecture is built using all wood joinery and heavy timber does not make it a timber frame,” or “just because it looks like a framing square does not make it one.” I find both these comments further indication on how cultural viewpoints can create biases in the telling of, and understanding historical facts. Middle Eastern and Asian cultures have been using framing squares, (some even metal,) for thousands of years. This also includes all the layout methodologies we now perceive as American or European. I have been a student of layout for over 3 decades in all it’s different configurations, (and from many different cultures,) from stone and clay sculpture to textiles and timber wrighting. “Square Rule,” as we know it today in America, may have only been around for a short time, as it came to be known during, and after the Industrial Revolution, but it is not a new concept by any means. I have theories of how it may have evolved, or came to be here in North America, but versions of it, again, have been in Asian for thousands of years, and perhaps longer in the Middle East. When I began to research steel rules in 2008, the reports I could find believed that Hawes invented the square in Shaftsbury, VT. I had a very hard time finding out about simple things, like tools in use in the United States before 1800. So I have been recording what I can find, as in this post. I am writing another post with more information. Thanks for adding your knowledge here. I am reading Will's bog as well. Very interesting -keep it up, please. Looking forward to your next post on this, thank you very much. I did make another entry on Will's Blog, you might find it interesting as well. I tried posting it here too, but it was too long, and was not excepted.